The Wheels of Time, Art With Horsepower, 1963 Studebaker Avanti, in the Washington Post, June 11, 2000. The photo shows the Avanti in the Petersen Automotive Museum collection in Los Angeles. The text reads: Art With Horsepower – The Avanti, a fiberglass sports coupe designed by the legendary Raymond Loewy, was Studebaker's first new body style in a decade. It was so modern, the car survived long after Studebaker Automotive ended production in 1966. Resting on a modified Lark Daytona chassis, the original Avanti had a smooth, wedge-shaped design with headlights set in round enclosures and no front grille. Air was supplied to the radiator under the bumper intake. Studebaker produced 4,643 Avantis for 63-64. The last Avanti made by Studebaker rolled off the assembly line in December 1963. After Studebaker stopped producing the cars, other automakers kept the car alive on a limited basis for more than two decades with little outward change. The 3,148-pound Avanti came with a V-8 engine, with two more-powerful versions offered as options. The supercharged version produced 335 horsepower. 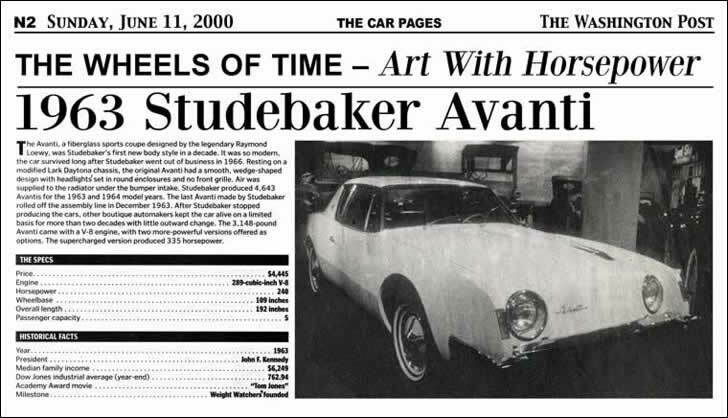 The 63 Studebaker Avanti in the Washington Post, "The Wheels of Time - Art With Horsepower" article in June 2000. Overall Length 192 inches Academy Award Movie "Tom Jones"